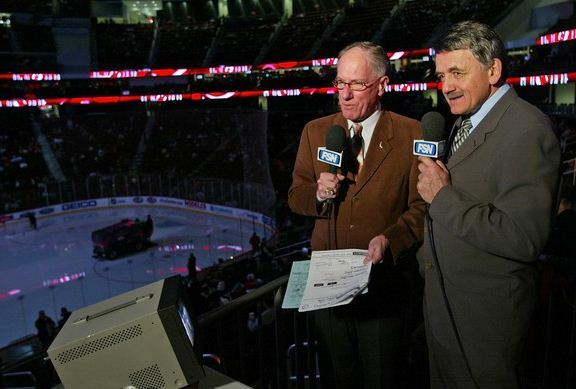 Broadcasters Doc Emrick and Glenn “Chico” Resch prepare for the NHL game between the Anaheim Ducks and the New Jersey Devils on February 8, 2008 at the Prudential Center in Newark, New Jersey. Being a broadcaster in any sport is always a challenge, and the NHL is no different. Imagine if you went to a hockey game, had a camera and microphone shoved in front of your face, and were told to describe everything that happened in the game for three-plus hours. It’s not as easy as it seems. It’s not about yelling “Score!” at the top of your lungs after a goal, or “Great Save!” after a goalie stops a shot. It’s about the little things that nobody seems to notice: subtle line changes, where and how a player got injured, changes in a team’s power-play strategy, whether or not a play was offsides, who touched the puck first on an icing call, background information on a new player, and most importantly, the ability to track a small round puck for an entire game. We seem to take all of this for granted, but the reality is, broadcasting a hockey game is a very difficult job to fulfill. Although there are plenty of excellent broadcasters in the NHL, a few of them stand out from the crowd. So without further ado, I present to you the ten best TV broadcasters in the NHL today. Hughson has perhaps the most soothing broadcaster’s voice in the NHL. His diction and enunciation is impeccable, and every single word he says has a distinct sharpness to it. He is the lead broadcaster for CBC, and has called every Stanley Cup Final since 2008. Oddly enough, the first time that I ever heard of him was when he was the voice of EA Sport’s NHL 07, which is still my favorite hockey video game. My personal favorite call is “Great Save Luongo!”, which he says every time Robeto Luongo makes a unspectacular save. Chris Cuthbert is Canada’s other announcing great, and it seems fitting that they work for rival networks. On April 18, he was positioned as a reporter in Washington, providing brief and periodic reports of the Washington Capitals-New Jersey Devils game to the national CBC viewing audience watching the Canadian network’s game broadcast from Montreal (the Canadiens against the Boston Bruins). A power outage struck the Montreal area, which postponed the game in that city, and CBC was forced to turn to Cuthbert in Washington to provide the full broadcast – play-by-play, analyst, host and everything else. The broadcast was totally done off the cuff as besides no regular analysts, there were no graphics or replay capabilities. His stellar solo effort caught the network’s attention, was nominated for a Gemini Award, and launched what has been a very successful broadcasting career. Strader is on this list because he is perhaps the most unbiased commentator in the NHL. Of course, he can’t be biased because he now works for NBC, but when he was broadcasting for the Phoenix Coyotes, you could hardly tell that he was their home announcer. He isn’t an announcer that stands out. He’s never over dramatic and doesn’t have a go-to phrase such as “Great save Luongo!”. But that’s perhaps what I enjoy most about the way he broadcasts games; always steady, consistent, and most importantly, unbiased (cough, Jack Edwards, cough cough). One of his finest games was Game 5 of the Western Conference Finals between the L.A. Kings and the Coyotes, where the Kings eliminated Phoenix and moved on to the Stanley Cup Finals. You might have expected him to lean a bit on the Coyotes’ side, considering he was their broadcaster for four years, but he showed absolutely no hint of homerism at all. As the “Voice of the Maple Leafs”, Bowen has called over 1,000 Leafs games since 1982, and I bet he’s showed the same passion and enthusiasm for the past thirty years. His catchphrase is “Holy Mackinaw”, which he exclaims after a spectacular play on the ice (ex. Jonas Gustavsson robbing the Ducks on this play). Listen to him yell, “Don’t tell me about heart and dedication and resilience, this is unbelievable!”, as he fails to keep his emotions in check. Never gets old. Daryl “Razor” Reaugh is the only color announcer on this list, and there’s a good reason why. He’s known for his interesting and unique descriptions that no one has every used before, and you can check some of them out here. My favorite “Razorism” is “cheeky”, which Reaugh will use to describe a sneaky play (ex. Mike Ribeiro’s between-the-legs shootout goal). Hahn is one of the most entertaining announcers to listen to in the league. He and Drew Remenda have the best chemistry out of any broadcasting duo, and on several occasions, they have made me laugh out loud in the middle of a hockey game. Being a Sharks’ fan and writer, I have the pleasure of listening to Hahn for 82 games a year. He was instrumental in bringing the Sharks to San Jose in the early 90s, and has been with the organization since day one. Unlike Joe Bowen, he has never cried in the middle of a broadcast, but his emotional attachment to the Sharks is understandably very strong. Once you hear the sound of this man’s voice, you can tell that he was born to broadcast hockey games. He’s got a special quality in his voice that can make a sewer sound exciting. Beninati has called Capitals games for the past seventeen seasons, but has freelanced for networks such as Versus and ESPN. That has led to many memorable calls, such as Brian Campbell “cold-cocking” RJ Umberger in the ’06 playoffs. See what I mean? I bet you all the money in my pocket that you can’t imitate this man’s voice. Here’s his call of Sergei Federov’s game winning goal in Game 7 against the Rangers. This is a very controversial choice, because as a hockey fan, you either love or hate Jeanneret. Sure, his over-dramatic goal calls and “we are not worthy” proclamations may be a bit annoying, but the truth is, Jeanneret is a Hall-of-Fame broadcaster, he has called Sabres hockey for over forty years, and is a living legend. He has a ton of catchphrases that he will go to, and some of them are spontaneously made up on the spot. Here is a compilation of his best calls, which includes “May Day” (my favorite hockey goal call in history), and “called a cop, he robbed him”. Because of his Los Angeles connection, I’m going to dub Miller the “Vin Scully of hockey”. Thirty-seven years as the “Voice of the Los Angeles Kings,” Southern California Sports Broadcasters Hall of Fame inductee, Wisconsin Hockey Hall of Fame inductee, Kings Hall of Fame inductee, Hockey Hall of Fame inductee, a star on the famous Hollywood Boulevard Walk of Fame, California Sportscaster of the Year in 1997 and 2002, and, to top all of that, he was honored by having the Staples Center press box named after him and was presented with a “lifetime contract” by the club in 1997. The only thing missing from his resume was to call a Stanley Cup victory, and he got that wish this past season when the Kings miraculously came out of nowhere to capture hockey’s holy grail. Like Scully, Miller doesn’t necessarily have a “go-to call”, but his consistency and durability in the broadcast booth is what sets him apart. Forget hockey. In my opinion, Doc Emrick is the best broadcaster in all of sports, hands down. As NBC’s lead play-by-play man, he has called Stanley Cup Finals games for the past several years, and had been the voice of the New Jersey Devils until 2011. The way his sentences flow is just uncanny, and his dramatic descriptions make you feel like you’re actually at the game. His sharp and distinct voice is a perfect fit for hockey, and his contributions earned him the honor of being the first member of the media to be inducted into the U.S. Hockey Hall of Fame. But what sets “Doc” apart from the others is how his excitement attracts casual hockey fans. My mother, who doesn’t know the first thing about hockey, actually concentrated quite tensely on the last few minutes of a regular season game last season because Emrick was screaming at the top of his lungs during every shot attempt (of course, she had to ask me what “icing” was, but that’s beyond the point). I hope you enjoyed reading this list of the top ten TV broadcasters in the NHL today. I understand that there are some terrific announcers who did not make the cut, and I would like to apologize if this caused you any grief. But in all seriousness, I would like to hear from you. Who was your favorite broadcaster, current or retired? Who deserves to be on this list, and who doesn’t? Leave me a comment below, and hopefully we’ll start a nice debate.